Introducing the Ladder-Aide, the quickest, easiest, and safest way to use your extension and combination ladders on stairs. It's a compact and portable unit that doesn't require permanent installation on your ladder, can easily be moved from stair to stair, and can be used with a variety of ladders. With an anti-skid surface and micro-adjustable height (to within 1/8), it creates a stable, level base for use on stairways. Made for professionals and perfect for the every-day handyman, the Ladder-Aide is compact and portable, is self-storing, and weighs only 7.2 lbs. With rugged construction and heavy duty design, it supports type III and type II ladders. Why the Ladder-Aide? Scaffolding takes time to set up and space to transport. Articulating ladders are expensive and heavy. Leg extenders require permanent installation on each ladder. Ladder-Aide is cost-effective, easy to set up, and small enough to be a permanent and indispensable addition to your toolkit. This Featherlite 10 foot fibreglass Cross Step ladder has a Type IA duty rating with load capacity of 300lbs. This ladder combines the Shelf and Step Ladder for a 2 in 1 combination made to take on multiple placement locations. The shelf design and its unique V-Shape top and innovative locking mechanism allows for positioning against a wall, building, or pole. When unlocked, this ladder sets up as a regular step ladder. The angles of the step ladder allow the user to get closer to the work area. This ladders top also features a magnet and multiple slots that allow quick and easy access to your tools. Other features include the SHOX impact absorption system, heavy duty boots with slip resistant tread, inside spreader braces that protect the ladder during transport, heavy duty reinforcements and double rivets. The Featherlite FXS6910 fibreglass Cross-Step ladder meets or exceeds the safety standards set by ANSI, CSA, and OSHA. This Featherlite 8 foot aluminum combination ladder has a 225 lb load capacity, rated Grade II. This ladder allows you to work in 3 different positions. Stepladder, extension ladder, and stairway ladder. It features outside pinch-proof spreaders, mar resistant rail end caps, and slip-resistant shoes. The Featherlite FL-2287-08 aluminum combination ladder meets or exceeds the safety standards set by ANSI, CSA, and OSHA. Ladder-Aide Introducing the Ladder-Aide, the quickest, easiest, and safest way to use your extension and combination ladders on stairs. It's a compact and portable unit that doesn't require permanent installation on your ladder, can easily be moved from stair to stair, and can be used with a variety of ladders. With an anti-skid surface and micro-adjustable height (to within 1/8), it creates a stable, level base for use on stairways. Made for professionals and perfect for the every-day handyman, the Ladder-Aide is compact and portable, is self-storing, and weighs only 7.2 lbs. With rugged construction and heavy duty design, it supports type III and type II ladders. Why the Ladder-Aide? Scaffolding takes time to set up and space to transport. Articulating ladders are expensive and heavy. Leg extenders require permanent installation on each ladder. Ladder-Aide is cost-effective, easy to set up, and small enough to be a permanent and indispensable addition to your toolkit. 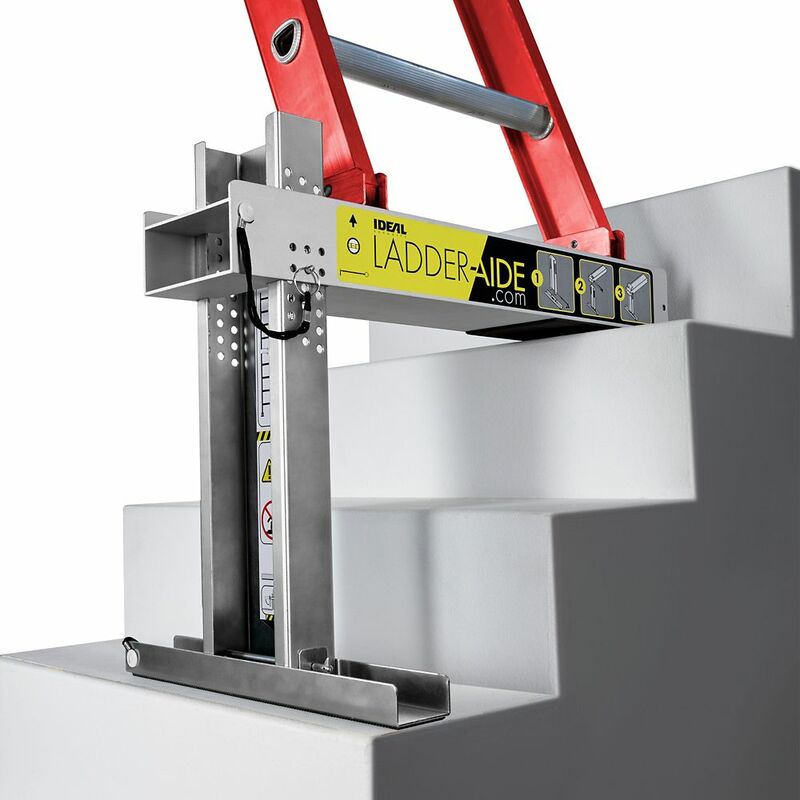 Ladder-Aide is rated 5.0 out of 5 by 8. Rated 5 out of 5 by LarryViv from Good Product I couldn't have done my stairwell safely without it. Glad I bought it! Rated 5 out of 5 by mikespainting from Best investment ever I'm a professional painter and owner of a painting company. Always struggled doing stairwell, purchased the Ladder Aid and wow we cut our time in half to paint stairwell now and very safely. Rated 5 out of 5 by JobJar from Right tool for the job I needed a ladder base to paint the tall curved wall in the middle of a curved hardwood staircase. I talked with local hardware staff, painters and contractors and the general consensus was to find an excuse to avoid painting it. If I had to I should build a custom platform or put up a full scaffolding rig. This thing is small, easy to store, well built, cleverly designed to adjust in 1/8 inch intervals and the rubber on the bottom protected the stairs. It's designed for straight extension ladders so I paired it with the telescoping one. It doesn't seem to be well known but it was perfect for the job. What's the maximum weight it can support? The Ladder-Aide is to be used with a Type II Ladder which has a weight load capacity of 225 LBS includes users and materials. The weight load is measured by the weight load capacity of the ladder.